Burnley FC in the Community picked up the Community Club of the Year award at the Northwest Football Awards for the fourth year running. Honoured for the ongoing impact the charity is having across East Lancashire, the Clarets’ official charity beat both Manchester City in the Community and Everton in the Community to claim the award. Brian Nelson, chairman of Trustees for BFCitC and Burnley FC Director, said: “I am thrilled that Burnley FC in the Community have received this honour once again. For the fourth year in a row, the team are making their mark in the footballing world for delivering their life-changing work. 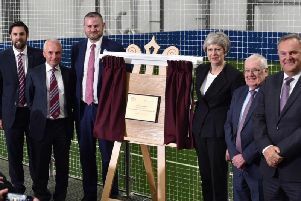 Neil Hart, chief executive officer of Burnley FC in the Community, said: “We started a journey almost five years ago to wield the power of Burnley FC for good in our town. For this work to be acknowledged at the Northwest Football Awards every year since then is a testament to the ambition, belief and passion of the team. “Each year, we feel the swell of support growing for our work – it’s so important to us as we couldn’t do what we do without the backing of our club, key partners, businesses, organisations and individuals. Neil Hart and Lewis Rimmer, disability development manager, also picked up the Impact Award on behalf of former Burnley FC striker Danny Ings at the awards. The honour was in acknowledgement of the lasting legacy Danny has left in Burnley through the Danny Ings Disability Sport Project. Through the work of the project, more than 800 disabled people access sport every week in Burnley. In the past 12 months, Burnley FC in the Community has engaged with 27,000 people through its sport, education, health, social inclusion and facilities projects. Investing more than £2.5m in the local area, the charity uses the power and inspirational status of Burnley FC to create lasting, positive change in communities.